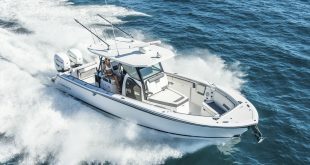 Since its introduction, the Ranger R-21EC has earned a loyal following among enthusiasts who enjoy cruising at its classic best. And today it’s even better, with a boatload of improvements from greater interior volume and higher speed, to more responsive handling and convenient storage spaces. Owners of this popular vessel have always measured fuel use in pints per hour, not gallons. With a refined hull design, the new Ranger R-21EC delivers significantly higher speeds and even better economy, bringing more cruise destinations within easy reach. And with a new cabin design that’s eighteen inches longer and seven inches wider, there’s room inside for pilot and companion seats, head, galley cabinet and a larger berth…greater comfort to make the trip all the more worthwhile. There is no doubt that this cuddy cabin, day cruiser, overnighter will stand out from the crowd. For those in the know, its practicality and efficiency brings pure enjoyment to their personal boating. 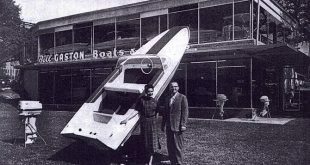 The fiberglass cockpit of the R21-EC (the “EC” referring to the new Extended Cabin design) accounts for almost exactly half of the length of the boat. The pilothouse area of the cabin is designed for two persons with the helm to starboard immediately forward of the refrigerator and a passenger seat with footrest to port just ahead of the standard galley with sink, pressure water, and single-burner stove. A comfortable and roomy-looking V-berth with center-mounted porta-potti is a couple of steps below and forward. Inspired by a traditional Bristol Bay trawler design, the Ranger R-21EC will never go out of style, ensuring both lasting appeal and maximum resale value. 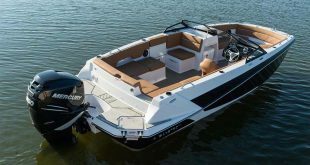 Easily trailerable, this boat rewards its owner with a level of versatility that few other cruisers can match. Lastly, if you don’t mind being the center of attention wherever you launch, dock, cruise, or anchor, and if you are ready for something relaxing, relatively efficient, to fully enjoy every boating moment, and savor every sensual pleasure of your boating days, then a Ranger Tug R-21EC could be the boat for you. Nautical Ventures recently became a Ranger Tugs dealer. 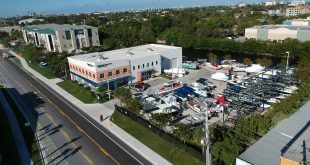 With locations in Fort Lauderdale, North Palm Beach and Riviera Beach, Nautical Ventures is proud to offer these amazing vessels to the South Florida boating community. It’s a perfect boat for South Floridians to cruise throughout the Florida Keys. One can easily go island hopping across to the Bahamas. Or cruise across state, through Lake Okeechobee, and around the Gulf Coast. If you’re in a hurry to go nowhere fast, Nautical Ventures has the Ranger Tug boat just for you. Nautical Ventures has been serving the South Florida boating market for over 30 years. They’ve been helping boaters in Palm Beach County, Broward County and Dade County get on the water to enjoy trouble-free boating. They service everything they sell and they are factory trained to warranty everything they carry. When you buy from Nautical Ventures, you’re not just buying a boat… you’re buying the experience.